Scrutiny has been able to report insecure content for a while; links to insecure (http) pages from your secure pages, and secure pages which use resources with insecure (http) urls. Scrutiny has even been able to alert you to these problems at the end of the scan. The question was "why are these things in different places" (pages with mixed content were accessed via the SEO results and 'rogue' links to insecure pages were with the links results). With version 7.3 this has all been made a little more user-friendly. There's a new results table which shows all of this together in a usable way. Also check 'Alert when links to http site are found' in Preferences > Links. At the end of the scan, if any issues are found, you'll be alerted and asked whether you want to go straight to a table of results to see the issues. The information is still in the old places too; see the details of 'links to internal http pages from secure pages' in the links tables by choosing 'http: links' from the Filter. 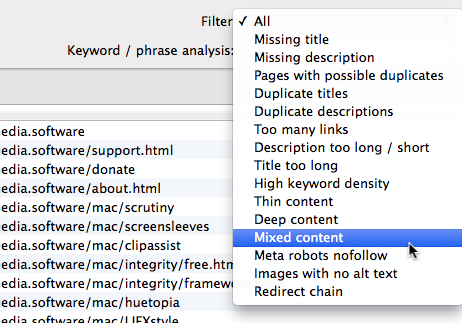 And you can see pages with mixed content in the SEO results as before, Select 'mixed content' from the Filter drop-down button. If any pages contain links to insecure resources, they'll be listed. This is all in Scrutiny version 7.3 which has just been released.